Famous Japanese animation director Hayao Miyazaki has a very large following. It’s a group I’ve never really been a part of, mainly due to not having seen his films. I’ve never been a huge Japanese animation fan. I can’t really pinpoint the reason other than the style of animation doesn’t draw me in (no pun intended). I saw Spirited Away when it was first released and wasn’t a fan. I’ve been told I should revisit it; I might enjoy it more now that I’m older. I’ve also been told to check out Miyazaki’s other films. After seeing The Wind Rises (which was nominated this year for an Academy Award for Best Animated Feature), I just might do that. Hit the jump to check out my review. 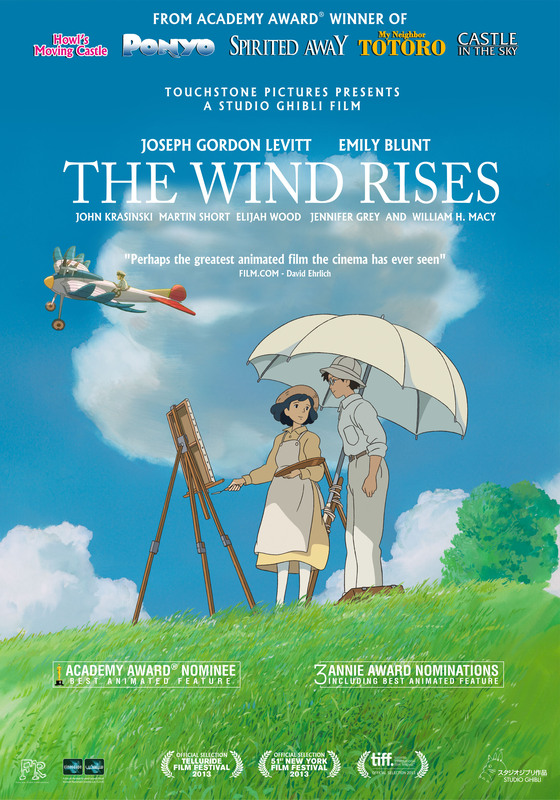 The Wind Rises follows Jiro, a lover of airplanes who dreams to one day be a pilot. Realizing that his bad eyesight will never allow him to achieve that dream, he decides instead to design airplanes, becoming one of Japan’s most influential aeronautical engineers during World War II. It’s based loosely on the lives of Tatsuo Hori and Jiro Horikoshi, the latter being the designer of the Zero fighter. The film is grounded in reality and feels like a biopic although it does have it’s fantasy moments, mostly played out in dream sequences. Jiro (voiced by Joseph Gordon-Levitt) is a dreamer and he has these shared dream sequences with the famous Italian aeronautical engineer Caproni (voiced by Stanley Tucci). Jiro often visualizes his designs in his head to see if they will work or not. The sequences are often beautiful and the high points of the film. The movie is a tad on the long side (clocking in at 126 minutes) but it’s an enjoyable film. There is a love story between Jiro and a character named Nahoko (voiced by Emily Blunt) that brings an additional layer of emotional depth to the story. Jiro’s friend Honjo is voiced by John Krasinski and his voice work steals the show. My biggest criticism is with the very end. Without giving anything away, there is a moment where the film fades out and then fades back in to continue on for another 5 minutes or so. If the credits had begun to roll after the first fade out, I would have loved this movie but I feel they ruined it by adding on the ending that they did. Overall, I give it a B+.